Kendis Thompson of Seattle thinks she’s as normal as the next computer geek, and up till now, she’s been right. But her world is about to turn on its ear, for she is the daughter of a Seelie Court mage and her mortal husband—and her faerie blood is awakening. Suddenly the city she’s known all her life is transforming before her eyes. Trolls haunt the bike trails. Fairies and goblins run loose in the streets. An old woman who is not what she seems and a young wanderer running from his past stand ready to defend Seattle—and Kendis—from magical assault. She will need those allies, for the power rising within her is calling her fey kin to the Emerald City to find her. And kill her. Faerie Blood was my very first novel, originally published in May 2009 by Drollerie Press. It’s intended to be the first of a trilogy, as well as the first of a whole set of related works, including other novels and shorter stories. In the spring of 2012, I ran a Kickstarter project to re-publish Faerie Blood in a second edition, along with Bone Walker. I revised the book’s second edition to bring its “present day” up from 2003 (when I originally wrote it) to 2012, and added Dedication, Author’s Notes, Acknowledgements, and About the Author sections as well. I commissioned artist Kiri Moth to do the cover for it as well as the next two books of the trilogy, and my wife Dara Korra’ti did the new layout for the cover and for the print and PDF editions. We’re all really proud of how the book turned out! 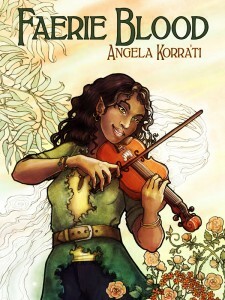 Faerie Blood is available for sale on most major ebook sites, which I cover on the Buy button at the top of the page. Some of these places, like Amazon, have many international versions of their sites. And others, like Kobo, distribute in turn to other platforms. Since I’m distributing Faerie Blood via Draft2Digital, they maintain a Universal Book Link for me, which tracks all the places the book is sold! So if you’re an international reader, and/or you don’t see your favorite store on the Buy button, try the Universal Book Link at books2read.com! You can visit my Square storefront to buy the ebook edition directly from me, and if you’d like to use a credit card to pay. Last but not least, I also accept payment sent directly to me on Paypal, via the link https://www.paypal.me/annathepiper.